Welcome to startrek_lims! This is a Last Icon Maker Standing Community! So I'm putting this community on hiatus for now. So far we have 7 people signed up and we need at least 15 before I can post the first challenge so please promote the community in your journals! Here are the sign ups for round 3! Don't forget to read the rules in the profile before signing up. 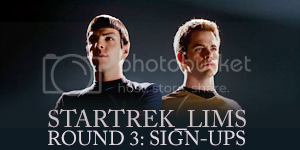 For this round the challenges will only be from the new movie Star Trek XI, that way I can use better quality images for the challenges. This is a very cool idea for a lims and you should check it out! With this lims there is going to be 26 rounds, one for each letter of the alphabet. We didn't get many votes but the results are clear! Because there is a limited supply of high quality images for alot of the tv series and I'm not very familiar with some of the tv shows, I was wondering if you all would be interested if the next round only focused on the new movie? It would only be the next round unless everyone wants to keep it that way. would you be interested in signing up if the next round only focused on STXI? So far we have TWO votes and we really need more so if you have a second please go here and vote! misplaced_angst this is your last reminder to enter your icons in the final challenge! They are due Today! the 3rd of February. Please let me know if you are planning on entering and if you need more time. Here's the first reminder to enter your icons in the final challenge! They are due Wednesday the 3rd of February. So you still have 6 days to enter. Congratulations to our finalists! Here is the last challenge for this round.